SAP is a very interesting workload for cloud and in this first part in a series of articles around running SAP on AWS (Amazon Web Services), I will talk about the benefits and some parameters to consider before running SAP on cloud along with some use cases and then focus on running SAP on AWS in the later articles. 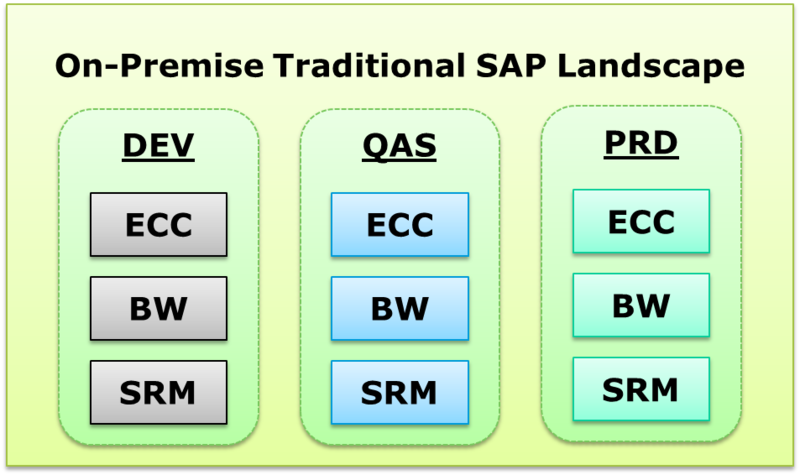 Traditionally SAP implementation on-premises has been a very challenging task requiring solution architects and consultants putting in long hours to address key requirements like High Availability, Scalability, Elasticity, Business Agility & Security whilst trying to keeping costs low which in most cases don’t go hand in hand. So here is an opportunity to drive Agility and Innovation in your SAP environment by implementing it on a cloud platform like AWS. Let me first talk about some key benefits of running SAP on cloud. Only OpEx & Lower Overall Cost – A no up front cost and a running cost model where you only pay for what you use gives you only Operational Expenses and no Capital Expenses, thus letting you keep your overall costs low while benefiting from cloud’s high scalability and efficiency. Agility – Provision new SAP systems on-demand in minutes compared to days & months in an on-premise setup, and get the needed speed in terms of Time-to-Market. Elasticity – Cloud provides the benefits of flexible capacity and elasticity which is a much needed requirement in SAP implementations. Meet your SAP sizing needs by scaling up or down on-demand through virtually unlimited pool of Compute, Storage & Networking resources available in cloud platforms. Focus on Core-Business – Not having to manage the core SAP infrastructure lets you shift your focus to your core business and invest time & money for its growth. Security – Security measures like firewalls, encryption, multi-factor authentication, Virtual Private Network, dedicated connections between on-premise & cloud and isolated environments give you a peace of mind when it comes to the security of SAP systems on cloud. 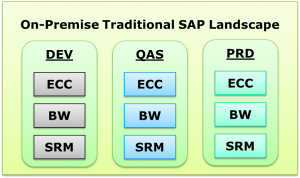 Customization – If your SAP landscape has custom modules and applications that integrate with SAP then their feasibility on cloud and/or interoperability & integration with other modules and applications on cloud must be considered. Compliance – Most cloud platforms conform to industry standard compliance like HIPAA, SOC (1, 2 & 3), ISO 27001, PCI DSS to name a few, but if you have a specific set of compliance requirements or custom security needs you may have a constraint in running SAP on cloud or may have to choose the right cloud deployment model. Data Confidentiality & Control- A need for having physical access to data & control over SAP systems could be a road block in running SAP on cloud; a hybrid model option can be looked at. Service Level Agreement (SLA) – It is important to check the SLA provided by cloud providers and ensure that it falls in line with your organization needs. Use cloud either for hosting complete or partial production systems and get benefits like real time sizing, elasticity and agility. Extend SAP to cloud by using it for non-production workloads like testing, training, demo, sandbox, documentation and archiving where you benefit from on-demand access to resources paying only for what you use with no upfront cost. Another important use case is for backup & disaster recovery. SAP legacy systems, temporary implementation for system upgrades and OS/DB migrations are also some good use cases. An SAP-TCO study by VMS AG stated “The research discovered that running SAP applications on AWS can provide infrastructure cost savings of up to 69% compared to the same system running on-premises”. To foster some confidence if implementing SAP on AWS, here is a bit about the SAP & AWS alliance. Apart from the partnership between SAP & AWS, SAP has also been an AWS Customer since 2008. AWS is SAP certified Global Cloud Services Partner & Global Technology Partner. SAP products on AWS are certified for “Production Level” deployments. So, whether it is a self managed or vendor managed SAP deployment you are looking for, with a cloud partner that provides end-to-end Consulting & Managed services, your SAP transition to a cloud like AWS can be less overwhelming. With a strong foothold & in depth experience into Amazon Web Services consulting, we at CloudThat can help you implement or migrate SAP workloads to AWS, thus having AWS provide scalable resources & manage the underlying infrastructure for you with no upfront capital expenses. If you have any questions regarding use cases like Hybrid SAP, Backup & Disaster Recovery for SAP, demo SAP systems or would just like to discuss the feasibility of running SAP on cloud, e-mail me at sangram@cloudthat.in. And stay tuned for the next part in this series where we look into the services of AWS that are relevant to SAP.